What do you think about pre-washed quinoa? Okay or not okay to eat? I read something about the rinsing process taking away some of the health benefits. Before I get to the answer, let’s explain why quinoa needs to be rinsed prior to cooking. Turns out this delicious supergrain’s external layers are naturally coated with a chemical compound known as saponin. Saponin serves as a protective barrier against birds, reptiles, and even UV light. It also, however, imparts a very bitter taste. Rinsing quinoa prior to cooking it guarantees the removal of this bitter flavor. 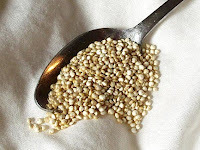 Since each quinoa grain is so tiny, though, rinsing can be very cumbersome if not done in an appropriately-sized strainer. Alas, some companies — like Ancient Harvest — take care of that by selling pre-rinsed quinoa. Fortunately, this process does not leach out any vitamins, minerals, or phytonutrients. What would you suggest as the “healthiest” oil to use when cooking crepes? Hi, Andy, on the subject of quinoa, it seems that some people get a bad reaction to it. My daughter-in-law (who just discovered it and loves it) got very sick after having some for dinner (throwing up throughout the night and a good part of the next day). The same thing happened to a friend. I love quinoa myself and have no problem with it. I would be grateful if you could tell me more about the substance in quinoa to which some people might have an intolerance. In both cases (my daughter-in-law and the friend), the quinoa had been rinsed before cooking and other people shared the meal with no problem. MC, hmmm… I have never heard of aquinoa allergy, although that is not to say it does not exist. The one thing that comes to mind is that your daughter-in-law may be sensitive to oxalates in food. If that is the case, she would also have problems with beer, kiwi, celery, kale, spinach, strawberries, whole wheat flour, and peanut butter. If she can eat those foods without any symptoms, then it is possible that a portion of whatever else she ate WITH the quinoa was not cooked/handled properly and resulted in some sort of foodborne illness. Thank you for your reply, Andy. My daughter-in-law can have beer, kale, peanut butter, strawberries, etc. without any problem. Everybody ate the exact same thing she did and nobody else got sick. The only thing, she said, is that she ate a lot of it because she loved it. So could it be indigestion? Anyway, thanks for your input. I’ll keep my eye open for another possible explanation.